Ever watch "American Idol" Hollywood Week and think, "What group night needs is more drama"? Well, you're in luck. This year, instead of letting contestants choose their own groups, executive producers Nigel Lythgoe and Ken Warwick announced that groups had been chosen for them. The twist resulted in a few hot-mess squads, including Country Queen, made up of two country singers and two glam rockers, and Super 55, who complained about Cuban native Lazaro Arbos' limited communication, thanks to a severe stutter and not knowing much American music. But the prefab groups also created some happy accidents, like Charlie Askew being placed with two gospel-trained singers for a come-to-Jesus performance of Bruno Mars' "The Lazy Song." "Idol" separated the men and women for the first Hollywood Week rounds, and we're only getting the guys this week. Before reaching group night, we started with some standout solo performances. Micha Johnson might have picked up a speech impediment after tonsil surgery, but he proved yet again that he's got more than just a hard-luck story. The 24-year-old Georgian — who was chosen as one of our early "Idol" favorites — put a country-fried spin on Elton John's "Benny and the Jets," even inspiring Keith Urban to sing along. Arbos introduced Robbie Williams' "Angels" with a stutter, but he didn't miss a beat during his performance, with Minaj making her hands into a heart for another of our early faves. Cortez Shaw, however, chose Whitney Houston's "I Will Always Love You" and started at the song's toughest and highest section, causing Keith and Mariah to smile ear to ear — while Randy and Nicki visibly cringed and exchanged glances. The divisive performance nearly kicked off round two for dueling divas Minaj and Carey, with Nicki interrupting Mariah to let Shaw know what a "poor job" he did with the song. Ultimately, Carey and Urban won out, sending Shaw through to the next round. Once groups were formed, the divisiveness moved from the judges to the singers. But things got off to a smooth start when the Mathheads — Nick Boddington, Mathanee Treco, Matheus Fernandes and Gabe Brown — hit the stage for a nearly flawless performance of Queen's "Somebody to Love"; all four sailed to the next round. 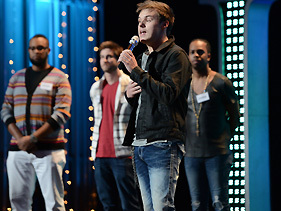 Returning contestant Johnny Keyser, meanwhile, managed to survive even though his group, Normal Hills, had serious problems with the lyrics and melody of the Four Tops' "Reach Out, I'll Be There." When it was time for Arbos' group, Super 55, to perform, they went with the Beach Boys' "Wouldn't It Be Nice." Almost everyone in the group botched at least some lyrics, but the guys who complained most about how Lazaro held them back ended up being cut, while Arbos and Christian Lopez advanced. The other drama-filled group, Country Queen, also had 50/50 results. The two country crooners fell victim to Extreme's "More Than Words," while JDA and Joel Wayman moved on.